I was asked to do a large banner with the size of 46in x 81in and the only other information I was given with this project is that it would be printed at 300dpi. What size and resolution document should I produce and how did you calculate this? What type of information should I request the next time I am designing for a large print? This image will include a collection of multiple smaller raster images, whats a good way to make them look good blown up? Edit: I apologize for not being very clear. I guess my question is if I am producing an image that needs to fit on a 46x81 space should I be designing an image that is 46x81 or a smaller image that matches same aspect ratio? I will address your first two questions. In physical units + dpi. This is the case of the specs that you were given. They have requested a document that is 46in x 81in (physical units) at 300dpi (resolution). These two ways are equivalent. You can convert from one to the other by multiplying the physical units by the resolution (or dividing the pixel dimensions by the resolution). So, in your case, you can create a document that is 46*300 x 81*300 pixels (13800 x 24300 pixels). This is largely discussed in discussed in this other answer: Will increasing the dpi of my image (without re-sampling) hurt print quality? You don't need to do this calculations yourself in Photoshop, by the way. You can create the document directly using the physical + resolution dimensions. Just make sure you select the proper unit. 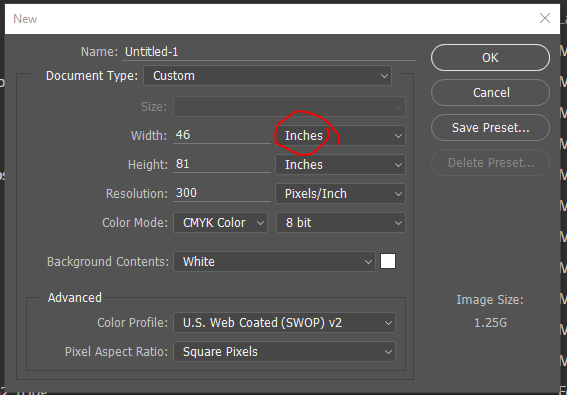 Photoshop will create the document with the correct pixel dimensions. In terms of what type of information you should ask in the future, I think the specs that you were given where perfect. Most of the time clients forget to give you the physical dimensions. They would say: I need a 300dpi image. In this case they gave you the dimensions and the dpi, which is perfect. In the future, just make sure you have either the exact pixel dimensions or the physical + resolution combo as they gave you this time. Not the answer you're looking for? Browse other questions tagged adobe-photoshop print-design dpi resize raster or ask your own question. Photoshop resize image to specific size, keep proportion?